Facts, history and information about the life and lifestyles of Native American Indians. Birch Bark Canoes were the main type and mode of transportation used by the Native American tribes who inhabited the Northeast woodlands, and eastern Canada. The design and style of the birch bark canoes were based on the natural resources that were available to the tribes, in this instance the people made use of the numerous birch trees found in the forests and woodlands of their tribal lands. The tribes built canoes made from the bark of the birch trees over a wooden frame. These canoes were broad enough to float in shallow streams, strong enough to shoot dangerous rapids, and light enough for one man to easily carry a canoe on his back. The life, history and lifestyle of Native American Indians is a varied and fascinating subject. The following fact sheet contains interesting facts and information on Birch Bark Canoes. Birch Bark Canoes Fact 2: Birch bark is a strong and water-resistant material that can be easily bent, cut and sewn. This made birchbark ideal for making the boats that were so important to the way of life of many Native American tribes. Birch Bark Canoes Fact 3: The names of Northeast woodland tribes who built and travelled in Birchbark canoes included the Abenaki, Chippewa (Ojibwe), Huron, Kickapoo and the Pennacook. Birch Bark Canoes Fact 6: There were many different types and species of birch trees including the Paper Birches (Betula papyrifera), Yellow birches (Betula aleghaniensis, Cherry, Sweet and Black birches (Betula lenta) and the River birches (Betula nigra). Birch Bark Canoes Fact 7: The Paper Birch tree is also known as the Canoe Birch and this was the favored tree used by many Native Americans. The trees can grow to over 80 feet tall and 16 inches in diameter. Birch Bark Canoes Fact 9: The birch bark canoes were extremely important to the Native Americans. They provided a fast and easy mode of transportation that enabled them to travel long distances on hunting, fishing and trading expeditions. They also enabled Native Americans to gain access to hostile, enemy tribes to launch attacks in considerable numbers. Birch Bark Canoes Fact 13: The Mohawks and the other nations of the Iroquois Confederacy primarily used elm bark for their canoes due to the lack of suitable birch trees in their lands. They also built heavier, dugout canoes that were built by the waterways, used to get to their destinations and left for future use. Dugout canoes were far too heavy for portage. 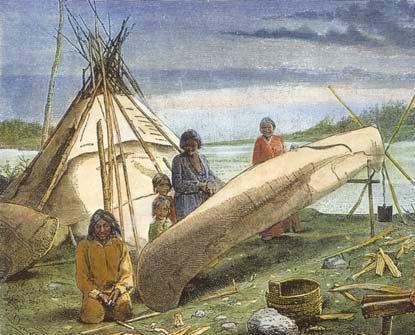 Birch Bark Canoes Fact 14: Other Native American Tribes also used both the Birch bark and Dugout canoes such as the Mohican, Fox, Sauk, and the Lenape. How were the Birchbark canoes made? A step by step guide on how to make Birch bark canoes.